Oh yeah, that’s Papa Grows Funk doing “Fish Eyed Fool”. Before that we heard Stanton Moore with “Kickin Up Dust” and “Pungee”. Stanton Moore was recorded live at the Fox Theatre in Boulder, Colorado on February 23, 2005. Both Stanton Moore and Papa Grows Funk deliver New Orleans Funk mixed with jazz and blues. 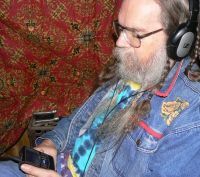 Something Blue is broadcast on KASU, 91.9 FM, and streaming on the internet at http://kasu.org. I’m Hairy Larry, host of Something Blue. Visit the Something Blue website at http://sbblues.com to listen anytime and for clickable links to more great music by these bands. Papa Grows Funk was recorded live at The Blind Tiger in Greensboro, North Carolina, on October 22, 2005. Coming up next Papa Grows Funk is “Walkin’ To New Orleans” and Stanton Moore has “Twitchy Feet”. Now that’s what I’m talking about, another great funk band, Soulive, playing “King’s March” and “Lenny”. Soulive was recorded live at the Ardmore Music Hall in Ardmore, Pennsylvania, on March 3, 2018. Closing the show here’s Soullive playing “Revolution” and Papa Grows Funk does “Stinky Snake”. Until next time this is Hairy Larry reminding you once again to keep it funky. This entry was posted in Shows and tagged Blues, Funk, Jazz, Live Music Archive, Papa Grows Funk, Soulive, Stanton Moore. Bookmark the permalink.